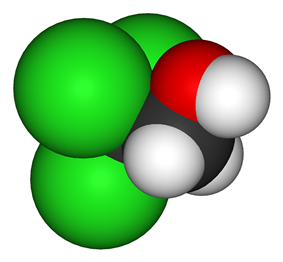 2,2,2-Trichloroethanol is an ethanol, except the hydrogen atoms at position 2 are replaced with chlorine atoms. In humans, its pharmacological effects are similar to those of its prodrug, chloral hydrate: it is used as a sedative or a hypnotic. The hypnotic drug triclofos (2,2,2-trichloroethyl phosphate) is metabolized in vivo to 2,2,2-trichloroethanol. Chronic exposure may result in kidney and liver damage.